Dieter Dechant outlasted a giant field of 10,015 entries to reach his ultimate goal of winning a WSOP gold bracelet in Event 19: THE GIANT - $365 No-Limit Hold'em. Dechant took home $291,906 for his outstanding performance. The win clearly meant a lot to Dechant, as he was overcome with emotion and brought to tears after the final hand was complete. Once he gathered himself, he went around hugging and kissing and high-fiving his friends and family members who were there to support him. It was a phenomenal day for the Las Vegas native, who said, "I have dreamt of this moment for 25 years. It's surreal." Dechant's live tournament cashes at the WSOP had totaled less than $1,000 before he took third place in Event #31: $1,000 Seniors No-Limit Hold'em Championship, earning $281,691. He wasn't done there, as he topped that result by roughly $10,000 with this victory. But for Dechant, the bracelet is far more meaningful. He now has his sights set on the Main Event, warning, "You aren't done hearing from me yet." The day started with 27 players remaining, and the action was brisk right out of the gate. The players dropped early and often, as nine eliminations came during the first hour of play. Action didn't slow down as the new redraw took place with 18 players remaining. 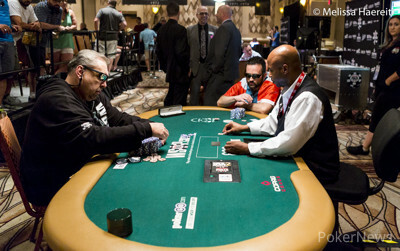 By the time the first break was reached at two hours into the day, just 14 players remained. 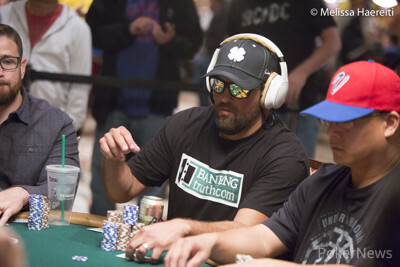 Canada's Hrair Yapoudjian held the chip lead with 34.8 million, followed by john Hutchinson with about 10 million fewer. 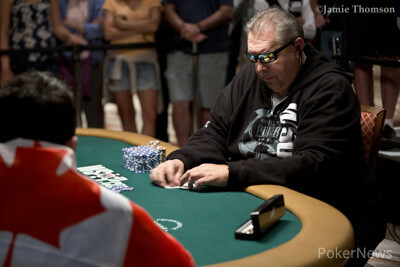 The unofficial final table was reached about an hour after the break. Martin Zamani was eliminated in 10th place after his pocket jacks couldn't hold against the eventual champion's ace-king. 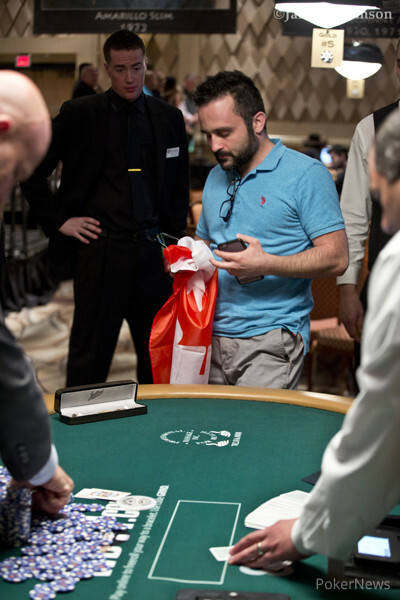 When nine-handed play began, Hrair Yapoudjian was still in the chip lead with about 46 million. Dieter Dechant was not too far behind him with roughly 30 million. Michael Guzzardi was the next casualty about 20 minutes later when he got into a preflop battle with ace-king against Yapoudjian's pocket tens. Yapoudjian flopped a set and took it down, leaving eight competitors. Andrew Crookston was the eighth-place finisher after getting into a blind-on-blind battle with Martins Kleins that didn't go his way. Crookston was then sent to the rail when John Myung woke up with ace-queen suited and held against his jack-eight off-suit. With seven players remaining, the Dechamp Show began. There was a period of about a half hour before Marcus Laffen became the first to tangle with the eventual winner. Dechant had pocket queens against Laffen's ace-king and won the preflop flip. At that point, Yapoudjian and Dechant had separated themselves from the rest of the field, both having more than 20 million more chips than their nearest competitor. Myung fell in sixth place after shoving his stack preflop and running into Dechant's pocket rockets, sending the former to the payout desk and the latter to the top of the leaderboard. Shortly thereafter, Kleins decided to get involved with Dechant, and that didn't work out well for the Latvian, as Dechant eliminated him in fifth place with queen-jack of hearts. Kleins rivered a set, but Dechant a straight, and that was a sign of further things to come. The energetic and fun-loving John Hutchinson went out next in fourth place. He had a rollercoaster day and battled hard for the entire event, eventually hitting the rail after taking a beat with pocket queens against Yapoudjian, which left him extremely short. The final blow was landed by Dechant, who took Hutchinson out with ace-king. 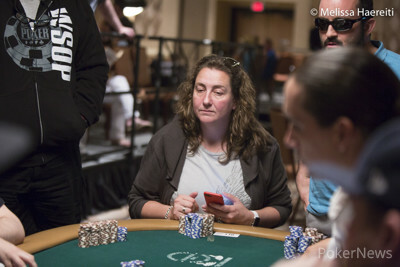 Sixty hands into final table action, Vera Kuhl hit the rail in third place. The German had a phenomenal run but fell just short after Dechant held against her queen-ten of hearts. He had ace-high, and it was good in the end, sending him into heads-up action. The duel began with Dechant holding a decent chip advantage. He had just over 123 million, and Hrair Yapoudjian had 78 million. Heads-up play lasted 15 hands between the two warriors. Out of the gate, Dechant continued to accumulate chips with his aggression, but the Canadian took several stands and closed the gap 10 hands in. By Hand #13 of heads-up play, Yapoudjian had taken over the chip lead, but the two got into a massive pot on the very next hand. Dechant rivered a flush with six-five of diamonds, and Yapoudjian rivered a straight with ten-nine of spades in a pot that had 98 percent of the total chips in the middle. That was the defining moment of the tournament, and Dechant took down the very next hand to seal the win when his king-four off-suit beat Yapoudjian's nine-five off-suit. 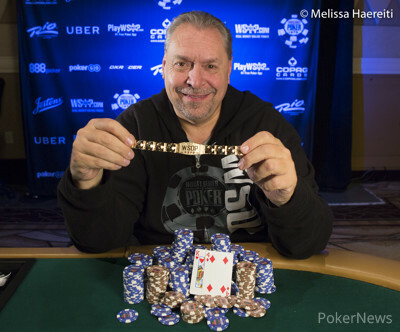 Yapoudjian ended as the runner-up, taking home $180,455. Dechant said, "I haven't played one hand of poker since the last World Series. I got rid of all my bad habits and have been focused and ready. This is almost karma, as I took a beat three-handed in the Seniors event to be eliminated, and today, I put the beat on the Canadian when I rivered that flush." Dechant is going out to enjoy some dinner, relaxation, and good company before he jumps into the Main Event, about which he says, "It feels like it will be another deep run." This concludes our coverage of Event #19: THE GIANT - $365 No-Limit Hold'em. We hope you enjoyed, and thank you for joining us along the way. Hand #76: Dieter Dechant shoved all in, and Hrair Yapoudjian called with his last remaining chips after having doubled up Dechant in the previous hand. The board ran out — no help for Yapoudjian, and he was eliminated in second place. Hand #75: Hrair Yapoudjian raised to 7,000,000, and Dieter Dechant called. The flop came . Dechant bet 10,000,000, and Yapoudjian called. The turn brought them the . Dechant bet 20,000,000, and Yapoudjian called again. The on the river completed the board. Dechant shoved all in, and Yapoudjian called. Dechant showed for a flush, and Yapoudjian showed for a straight. Dechant doubled up and left Yapoudjian with 5,500,000. Hand #69: Hrair Yapoudjian called from the button, and Dieter Dechant opted to check. They checked through the on the flop and the on the turn. The river completed the board. Dechant bet 7,000,000, and Yapoudjian called. Dechant showed , and Yapoudjian mucked. Hand #70: Yapoudjian got a walk. Hand #71: Yapoudjian raised to 6,000,000, and Dechant called. The flop came . Dechant check-folded to a bet of 8,000,000 from Yapoudjian. Hand #72: Dechant called on the button, Yapoudjian raised to 8,400,000, and Dechant called. The flop came . Yapoudjian bet 10,000,000, and Dechant folded. Hand #73: Yapoudjian raised, and Dechant folded. Hand #74: Dechant raised to 6,200,000, and Yapoudjian folded. Hand #62: Dieter Dechant was on the button and raised to 6,000,000. Hrair Yapoudjian defended his big blind. The flop was , and both players checked. The turn was the , and Yapoudjian check-folded to Dechant's bet of 10,000,000. Hand #63: Yapoudjian raised to 6,000,000, and Dechant folded. Hand #64: Dechant was on the button and raised to 6,000,000. Yapoudjian defended. 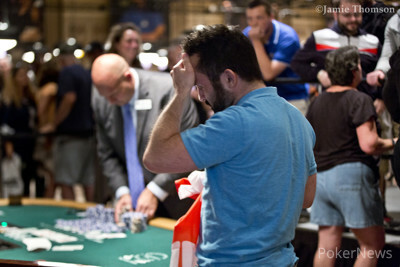 The flop was , and Yapoudjian check-folded to Dechant's bet of 10,000,000. Hand #65: Yapoudjian raised the button to 6,000,000, and Dechant three-bet to 22,000,000. Yapoudjian elected to fold. Hand #66: Dechant limped in, and Yapoudjian checked. The flop was . Dechant bet 10,000,000, and Yapoudjian moved all in for 58,500,000. Dechant folded. Hand #67: Yapoudjian limped in, and Dechant checked. The flop was , and both players checked. The turn was the , and Dechant bet 6,000,000. Yapoudjian called. The river was the , and Dechant bet 6,000,000. Yapoudjian called, and Dechant mucked his cards. Hand #68: Dechant called on the button, and Yapoudjian checked. The flop was , and both players checked. The turn was the , and Yapoudjian bet 3,500,000. Dechant called. The river was the , and Yapoudjian bet 7,000,000. Dechant folded. Dieter Dechant and Hrair Yapoudjian are beginning to battle it out in heads-up action, with the winner taking home a coveted WSOP gold bracelet and $291,240. Hand #60: Hrair Yapoudjian raised to 6,500,000 and took the blinds and antes. Hand #61: Dieter Dechant was in the small blind and bet enough to cover Vera Kuhl in the big blind. She called all in for her last 26,900,000. The board ran out . After flopping a flush draw, Kuhl could not get any more help, and she became the third-place finisher. Hand #59: John Hutchinson only had 2,100,000 left after paying the ante in the previous hand and this one. As he was in the big blind, it was an automatic all-in. Dieter Dechant shoved all in from the cutoff, and Hrair Yapoudjian was not happy with that. "Why are you doing that?!" he said. He folded and showed . The board ran out — no help for Hutchinson as Dechant hit his ace on the flop, and he was eliminated in fourth place.